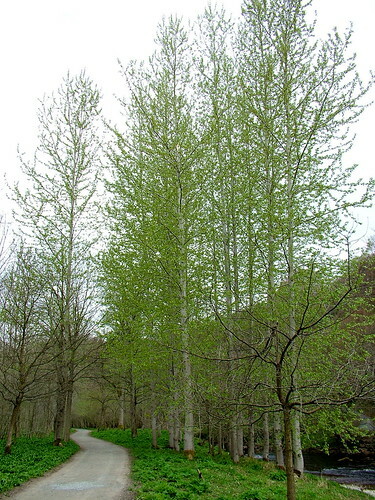 Yesterday morning I managed to remember to visit the balsam poplars as the buds break into leaf. The name gives the game away – they have a distinctive odour at this stage, rather pleasant. They do look a bit out of place compared to the rest of Strid and will be removed in due course under the “Recovering” SSSI status (see the oak in the foreground to take over?). They grow very rapidly and take root very easily from branches left on the bank. They are rather brittle too – three lost their tops in a medium breeze last year. The timber is very open being fast grown and I found a sample difficult to turn, but I bet it would be OK for carved bowls. 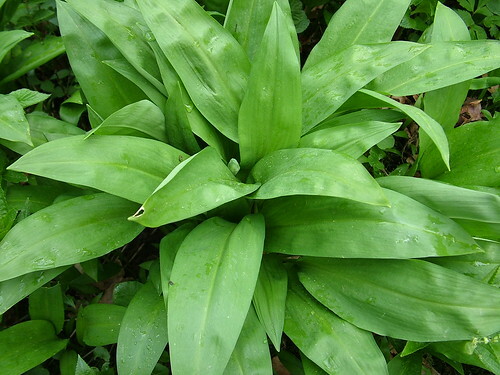 Wild garlic. See the flower bud coming? They do smell very strong when bruised. This entry was posted in Green woodwork, Spring and tagged balsam poplar, wild garlic by Flying Shavings. Bookmark the permalink.